The Faculty of Commerce and Management at Hitotsubashi University has begun a new educational program, intended for incoming students from 2013, which aims to foster individuals who embody the role of “Captains of Industry,” regardless of their nationalities or mother tongue, and who can moreover contribute to the development of the Japanese economy, Asian economy, and world economy as a whole. In this program, approximately 15 students will be selected in their second year to be fostered as individuals able to actively function in the world of international business. The launch of this program is an opportunity for our own Faculty of Commerce and Management, and Hitotsubashi University as a whole, to promote the development of truly global human resources. 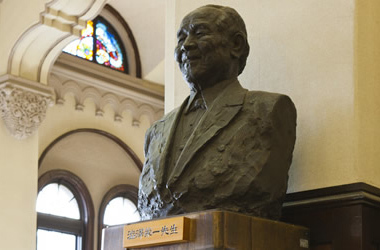 The role model of our program is Eiichi Shibusawa, who significantly contributed to the establishment of Hitotsubashi University. Shibusawa travelled to France at the dawn of Japanese industrialization and studied various business systems, beginning with joint-stock companies. He then endeavored to put these into practice, promoting such systems across Japanese society. He was an entrepreneur who was involved in the foundation of more than 500 companies, no small number of which have now become the core of the Japanese economy. Furthermore, he dedicated himself to commercial education, women’s education, and welfare work as well. He understood that business is not simply a tool for making money, but rather is a leading force to support the development of economy or society, and he endeavored to put this into practice through business. Moreover, Shibusawa exerted himself to the utmost to improve the relations between Japan and the rest of the world through popular diplomacy. For instance, he made every effort to solve trade friction between Japan and the US by encouraging mutual understanding through the exchange of business people in both countries. He also collected donations to alleviate flooding damage in China. In the Shibusawa Scholar Program, we will offer various classes in which students can develop interpersonal skills, critical thinking, and analytical skills useful for the development of enterprises, society, and economics, through constructing human networks with people of different cultural backgrounds, actively engaging in discussions, and proposing and implementing solutions to issues on their own initiative. In their first year, which precedes selection for the program, all students in our faculty are required to take Practical Applications for Communicative English (PACE) classes twice a week, in both summer and winter terms, conducted by faculty members who have qualifications and experience teaching English to speakers of other languages. Those selected to join the program will take introductory classes in commerce and management conducted in English in addition to classes like PACE in which they learn English as a communication skill. Furthermore, we offer not only English communication skills, but opportunities for students to become proficient with various abilities suitable to take up the mantle of “21st-Century Eiichi Shibusawa.” Specifically, these include opportunities such as discussions with business leaders active on the world stage, or participation in seminars led by businessmen or researchers active at the forefront of their fields internationally. All such educational initiatives are based on the ideals of small-sized, focused group education which is long-established tradition at Hitotsubashi University.